Dongara is located 65km south of Geraldton, on the former Midland Railway (to Perth) it is also a junction for the branch line to Eneabba. 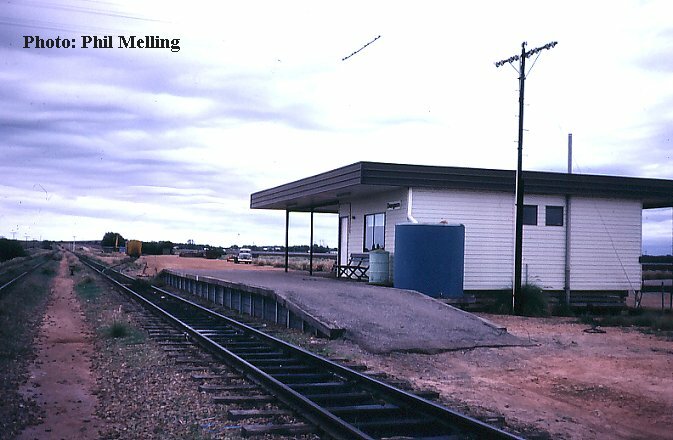 The existing rail facilities were not those of the original line, and today Dongara as a simple yard with no station building. The station yard cannot be entered as it barred by locked gates, entry only now being possible when there is an infrequent hired special passenger train passing through. 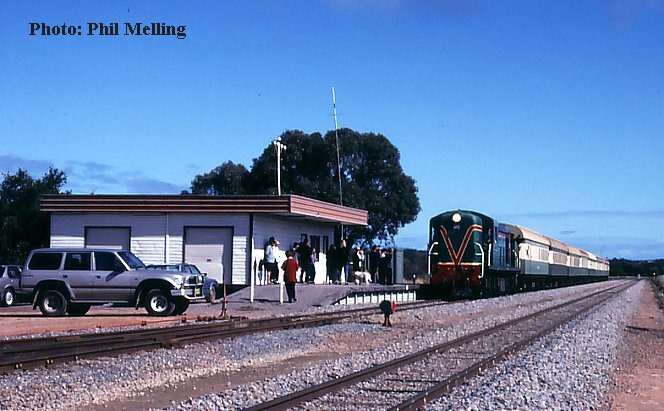 On the 29 August 1999, Hotham Valley Railway ran a tour taking Geraldton & surrounding areas passengers to Eneabba. English Electric C1702 is seen arriving at Dongara. The station building has now been removed from this site. 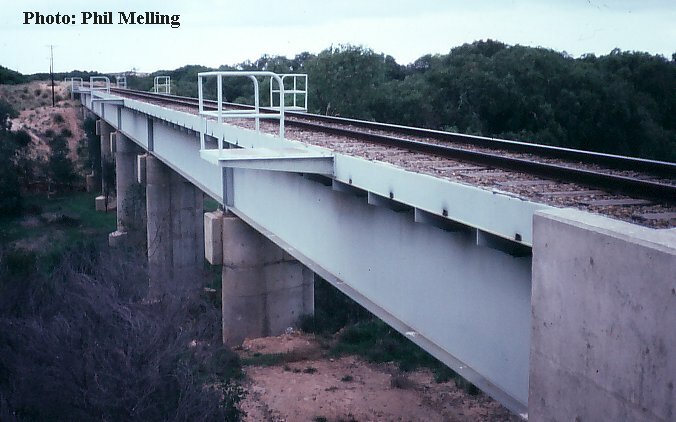 The Irwin River bridge at Dongara on 29 June 1985. The last time I went through this area was on a passenger train and the vegetation had grown up substantially and virtually hides the bridge. 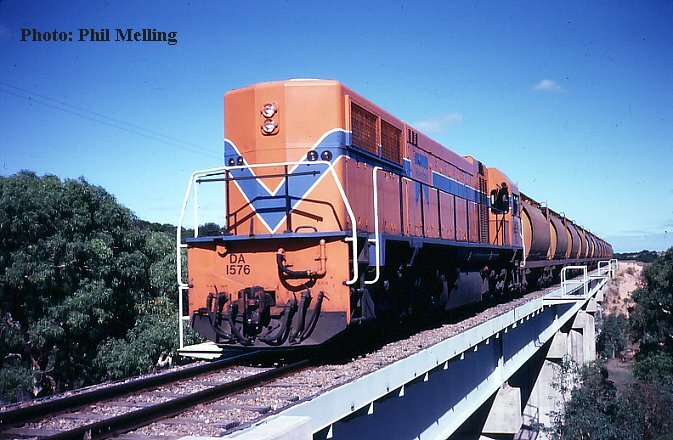 DA1576 hauls a loaded mineral sands train across the Irwin River bridge at Dongara on the 6 June 1983. 20 years later the mineral sands trains are normally hauled by P class diesels. DA1576 was used last year in company with DA1572 for around a week, albeit both locomotives in the later Westrail yellow colour scheme. A location I have not yet got a nice sunny photo at, even though a photo can be taken from the bridge behind and there is a train that runs 7 days a week. 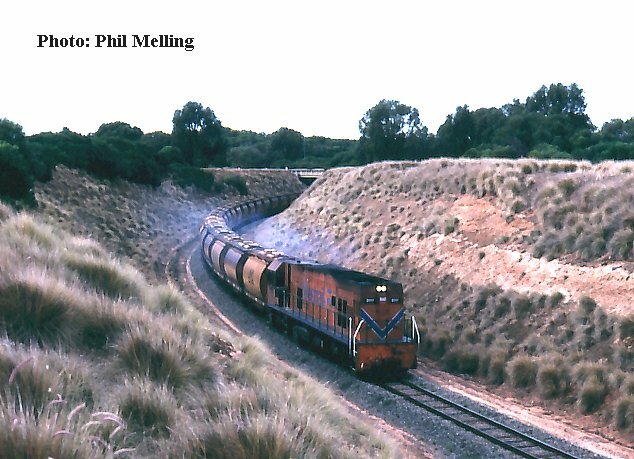 P2017 hauls a loaded mineral sands train through the cutting just prior to entering Dongara yard on 3 June 1996. Although I have got nice sunny photos of this area, I have not got any dating back to earlier than 1985, this view taken on 29 June 1985. Note the goods wagon in the yard. At that time there was still a general freight service between Perth and Geraldton.